A solar eclipse took place above, as mist consumed the fern-forest battlefield. The chirping of giraffe-sized Quetzalcoatlus filled the ears of the two tyrants, but not as much as the lightning and sizzling fire that surrounded them. Tyrance lifted his foot into the air and back down, sending sludgy mud flying into the air. His amber eyes squinted underneath his fearsome brow, as the battle he knew was coming neared its arrival. Tyrantic’s face was blank, mainly because he was trying his hardest to conceal the fear that the mere sight of Tyrance invoked. Yet, Tyrantic is not a pushover by any means—and this fight would not be easy for Tyrance. You could almost see figures in the wall of flame that seemed to halt its path at the perimeter of the fern-forest, almost cheering on the two combatants. Fear turned to anger and pain, as Tyrantic opened his mouth and released a terrifying bellow—one that made even Tyrance widen his stance in preparation. The False King had enough, and with all the scorn he had for his brother, charged. This was it. Tyrance bellowed, and too charged Tyrantic. The two collided into each-other, nearly cracking their craniums—as Tyrance duckedd his head low, before swinging it directly up into Tyrantic's lower jaw, dazing the beast. The False King went with the motion of his body, stumbling back, but whipping Tyrance’s face with his tail. The true Tyrant King roared aloud in pain, before clamping onto Tyrantic’s tail. Tyrantic swung his head towards his tail, trying to stop Tyrance—but he could not. Tyrance placed his right foot behind him, and with all his body strength hurled Tyrantic directly into a colossal fern ribs-first—breaking four of them. The False King rammed directly into the tree, breaking it directly in-half, as he stumbled to the ground. Tyrance breathed in deeply, before walking over to Tyrantic, his maw snarling with dominance. When Tyrance made it over, he analyzed his brother—who was not moving. Like a shock, Tyrantic swung his head around and clamped onto Tyrance’s ankle. The Tyrant King did not waver. He lifted his muscular theropod foot up and stomped onto Tyrantic’s back, forcing him to let go. Tyrantic rose to his feet and smashed Tyrance in the face with that of his own, before clamping onto his snout. Tyrance couldn’t even bellow, as Tyrantic sank his dagger-teeth into his nose. The Tyrant King began to swing his head around madly, jostling around Tyrantic—as Tyrance lowered and lifted his body in a repeating motion. The child of envy finally released his grip, but there wasn’t even a moment to regain his stride, as Tyrance rose to his maximum height and clamped onto the top of Tyrantic’s neck. Tyrantic bellowed in pain, as Tyrance deepened his bite, achieving eighteen-thousand pounds of bite-force—not his maximum. Tyrance stabbed his finger-cows into the ribcage of Tyrantic, before smashing him to the muddy ground. The False King began to use strategy, and rolled onto his side. Tyrance placed his foot on Tyrantic’s pelvis, before impaling him with his thick and sharp toe-claws. Blood trickled from Tyrantic’s torso and tail, as he kicked Tyrance in the gut—forcing the king to gasp for air. Tyrantic rolled back to his belly, and stood up—before ramming the right-side of his torso into Tyrance, nearly knocking him over. Tyrance struggled to regain his balance, as Tyrantic walked over to the tree he had collapsed—and picked up half of the trunk in his fearsome jaws. He then proceeded to smash the trunk into Tyrance’s tailbone, nearly breaking it. The Tyrant King collapsed to his feet, but as soon as he fell down he stood back up, and like the lightning that went on around them, turned to face Tyrantic. Tyrantic had a plan, and bellowed before running deeper into the forest, Tyrance in hot-pursuit. Lightning struck one of the redwood-sized ferns, setting the tree aflame an knocking it over. Tyrantic looked up to see the tree about to fall almost directly on him, but as any normal T.rex would see this as pure terror, he saw it as opportunity. The False King made sure he was a decent distance away from the fern, before twirling his body around with expert precision, and shoving back Tyrance—who was just about to catch him. The Tyrant King tripped and fell into a mess of vegetation, but he did not allow himself to stay down long—as the massive fern was directly above him. Tyrance used his toes to lunge away, barely maintaining his balance as the massive fern smashed into the ground—shaking it like an earthquake. Tyrantic bellowed laughing from the other side of the tree, which acted as a wall between the two. Tyrance licked a large wound around his neck, before contemplating his way around this tree. Tyrantic took this opportunity to continue his stride for the deadliest area of the fern-forest, the Quicksand Canyon. Tyrance saw no way around the tree beside walking to the other-side, which would take too long, even at his maximum speed. The Tyrant King purposefully filled his brain with all the traumas he had endured in his life—his parents death, failing his first hunt. These traumas and countless more flooded his brain, filling him with rage-filled adrenaline. Tyrance bellowed a deep guttural roar into the air, his neck expanding and shrinking, before turning around and jogging twenty-feet back. The Tyrant King then charged the tree-trunk, and with all his anger, all his might, exceeded his maximum speed of twenty-five miles per-hour. He reached a new speed limit, twenty-eight miles an hour, as he burst straight through the tree-trunk—sending giant pieces of wood flying into the air. Tyrantic halted his stride. He looked back in shock to see Tyrance charging him at an unprecedented level of speed. The False King bellowed in fear, before rising to his toes and too running—except he was running away. 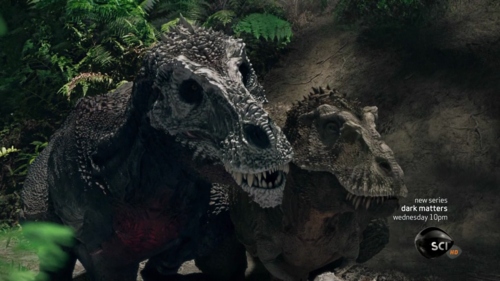 It was one of the greatest things you would ever see, two Tyrannosaurus bolting through a mist and flame covered forest—both on their toes, leaving deep imprints of their existence into the mud. The fires outside finally reached the ferns, setting them ablaze—heating up the battle even more, as Tyrance caught up to Tyrantic. The False King could do nothing but stare, as Tyrance tackled him to the ground—sending the two of them crashing down a small hill. The rex of peace and the rex of discord rolled down the hill, mud clinging to their thick hide. They finally landed in a canopy, as fire-covered ferns fell to the Earth, and lightning struck. Tyrance lifted his body slightly off the ground, before slicing Tyrantic’s neck with his teeth, and shoving him into a murky river with his skull. Tyrantic was drained, and knew he could not handle anymore—yet, something seemed to fuel the once king. He swam to the water’s edge, and rose to his feet—as though he wasn’t tired in the slightest. Tyrance halted his stride and jerked his neck back, looking in shock at Tyrantic—who was not even breathing heavy. Tyrantic began to coo in laughter, as from the top of the hill, countless rocks plummeted from the hill—accompanied by large pieces of wood, and ash. Tyrance bellowed in pain, as rocks impaled his flesh—spraying blood out, and a log the size of a fully grown Dakotaraptor slammed into his back. Tyrance collapsed to the ground, as even more rocks and wood fell onto his back—he couldn’t take much more. Tyrantic had succeeded in leading him to the Quicksand Canyon, and also had succeeded in pummeling Tyrance with the abundance of rocks and wood in the forest. There was only one thing left to do, finish the job. Tyrantic stomped over to Tyrance and clamped onto the top of his neck, before dragging the nearly immobilized tyrannosaur towards a pool of quicksand. Tyrance struggled, barely breathing, to escape Tyrantic’s grip—but the False King’s improved bite-force of sixteen-thousand pounds was too much. Tyrance halted his struggle, and succumbed to the pressure—his neck nearly breaking underneath the bite. Tyrantic had truly won, as he trotted over to a forty-foot lake of quicksand. With all his might, all his power, Tyrantic tossed his brother into the pool of death. Sycamores guarded this particular pool of quicksand, terrifying away animals with their mere shapes—which were that of Deinosuchus and various predators. Tyrantic’s sole dream had come true, he had killed Tyrance—and although he would not be king anymore, he could live out the rest of his days with the knowledge he was the alpha. Tyrance struggled in the sand, the mist clouding his vision—as he began to blackout. The sand consumed his thighs and tail, as Tyrance struggled to survive, Tyrantic laughing in the background. It seemed all over, and that fate had chosen a victor—as Tyrance bellowed one last time into the air, before collapsing into the sand. Tyrantic's laughing stopped, as he closed his gaping maw and stared at the almost entirely sucken Tyrance. Thoughts, feelings filled the brain of Tyrance, as he sank deeper within the quicksand. A feeling of failure, one of victory, and one of regret at having not been able to be with his pack—all of these kept Tyrance awake, even though quicksand flooded his head, forcing him to close his eyes. No, this would not be the end. Tyrance bellowed through the sand, and began to kick and clamber around—keeping his head outside of the sand. Tyrantic snarled in enjoyment at his brother’s suffering. The False King snorted to gain Tyrance’s attention, halting the true king’s struggle for a moment. Tyrantic trilled in Tyrannosaurus gestures that Giganoctus did not truly know how to invade and kill Tyranak, that a peasant like him never could have done it alone. Tyrance’s tired eyes widened, as it began to sink in. Tyrantic finally cooed it out, he told Giganoctus and his pack how to sneak within Taghia-Sakhra—and kill the Golden-Land’s T.rex. Tyrantic began to cluck in laughter again, but he wouldn’t be for long. Tyrance bellowed in anger, hatred and disgust, before struggling—this time at maximum power, he could not let Tyrantic live! The Tyrant King used all his muscles, everyone, and rose up from the quicksand—freeing his torso. Tyrantic stared in shock, as Tyrance lunged towards one of the sycamores. The one true king of the dinosaurs clamped onto one of the tree's branches, and with all his power used it to pull him onto the land. Tyrantic bellowed in fear, and attempted to run, but he could not escape the wrath of the Tyrant King—who tore the sycamore from its root and smashed it into him. Tyrantic roared in pain, but that was the least of it, as Tyrance charged, clamped onto his thorax—and hurled him aside. The False King struggled to his feet, and charged Tyrance one last time with all his power. He rammed into the king, but his full power was not even close to his, as Tyrance tanked his charge, clamped onto his snout, and pulled back—leaving deep wounds of which blood poured out of. Tyrance grabbed onto Tyrantic’s ankle with his maw and broke it easily, underneath his full power, twenty-two thousand pounds. The true king lifted Tyrantic into the air with his back, and rammed him into the sharp-thorn of a nearby conifer. Tyrantic was beaten, he couldn’t even bellow in pain, only gasping for air—as Tyrance dragged him across the canyon. Tyrantic, with one last burst of adrenaline slammed Tyrance’s skull with his, and clamped onto his arm. Tyrance hissed in pain, but it was nothing to the king—who retaliated with a bite on Tyrantic's eyes, blinding him—and leaving a deep gash. Tyrantic stumbled backwards towards another quicksand, but he halted his stride—using all his might to not fall over. The solar eclipse glistened Tyrance in a near holy light, as Tyrantic—with one final attempt lifted a log into the air and began to swing it at Tyrance. The Tyrant King dodged each and every swing attempt with expert prowess. One final stare, a definitive attack, the end; Tyrance charged Tyrantic, clamped onto the log and smashed it into his ribcage, breaking every rib, before ramming him to the right with his skull. Blood poured from Tyrantic’s mouth and body, as he stumbled back, falling into the lake of quicksand. Tyrance breathed in deeply, his lips revealing his teeth, as he looked at the struggling Tyrantic--whom chirped in sadness, as he sank deep within the quicksand, not having the strength to get out. Tyrance’s hatred seemed to slowly vanish, as he looked at his brother with contempt. Tyrantic stared at Tyrance, and cooed a loud “help me”, in tyrannosaur language. Tyrance never was like Tyrantic, never wanting his sibling to die—nor allowing it. Tyrance made no sounds, merely acting upon his thoughts, as the Tyrant King tore off a sycamore branch—and pointed it at Tyrantic. Tyrantic’s body was already deep within the quicksand, his neck and head being the only things poking through—yet he still clamped onto the branch. Tyrance began to step back and pull, just as he had all those years ago when Tyrantic fell in the very same puddle of quicksand. Tyrance pulled with all his might, yet Tyrantic did not budge. The False King’s body began to shake, as Tyrance continued to pull—but to no avail. Tyrance took one final step back, and yanked with all his might. The king looked over, hoping to see his brother at the quicksand’s edge—but he did not, no. Tyrance dropped the log and stared, his eyes wide, at his brothers head and half of his torso—the other having been ripped apart and left in the quicksand. Tyrantic was dead, and this thought finally clicked within Tyrance, making him realize that his brother had been dead for a long time prior. Tyrance crouched to the ground, and bellowed into the air, a last roar for Tyrantic. The adrenaline in Tyrance’s body settled, as the pains of his body returned, and he realized that he was within a wildfire covered forest! The Tyrant King began to flee the forest, having no time to mourn his brother—he had to live for his pack. Tyrance did not bellow, saving his strength, as the King of the Dinosaurs bolted through the forest—dodging collapsed fire-covered trees. Tyrance began to feel his energy drain, his muscles weaken. The Tyrant King’s run turned into a jog, which lowered into a limp. Tyrance bellowed into the air one last time, as another fire-covered fern crashed into the ground next to him, tripping up his already weakened stride. Tyrance was hurled down a hill, and into a large lake. The Tyrant King had no more energy, and sank to the bottom—his power drained. He stared through the lake, seeing the fire and destruction above. He began to feel his will to live waning, and his eyes began to close. No, it couldn’t be, but it was—Tyrance fell unconscious beneath the water. Thanks man, I have been waiting to do it for a long time. What was your favorite part? Thank you SR. When reading the final portion, listen to This, it will connect the feels. Why put in "both on their toes"? Tyrannosaurs always moved on their toes. ^Was trying to put in an image, also to make them move faster, I wanted a reason. I thought it was well thought out, but given all the written cues, I knew Tyrance would somehow find a way to win. It was obvious from the beginning, despite sinking in quick sand. ^Well Tyrance can't die, given that he is in The End xD. ^One, last chapter, is coming out soon.